“I Never Loved You” | Chin.Deep.In.Life. Her gaze collided with his. She must have misunderstood. She dared not ask him to repeat himself. He didn’t need to. 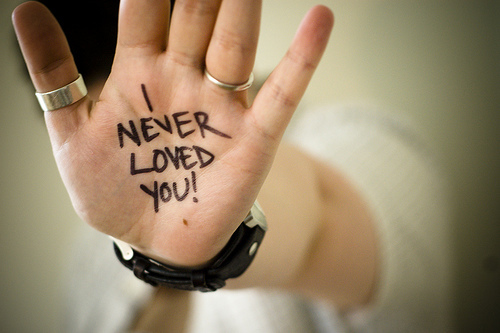 No one can mishear :“I never loved you” They were the only two people in the room. The words didn’t come from her. She looked away quickly, hoping he would realize what he said. And offer an apology, or retract the statement. For long, interminable seconds, she mentally repeated the words. Suddenly, she felt like the main character in a movie. In this particular scene, she stepped into one of those old, run down establishments on the outskirts of town. The type of place where, no one asked questions, or knows your name. The place where you go to drown your sorrows. And figure out what to do next. She looked around her, searching for the corner where the music was coming from. As her eyes adjusted to the dim interior, she spotted the shiny edges of the jukebox. There it was, old and familiar, playing a 60’s Ballard. She recognized the song immediately, because it was on repeat. The few patrons who remained, were either too lazy, or too drunk, to get up and change the song. No one turned to acknowledge her presence. Good. She grabbed the first empty stool in sight, plopped down, and stared straight ahead. The bartender was nowhere to be seen. She turned to “look” at the man who had uttered the words, which culminated everything else. It all felt a bit surreal. She felt like a passerby, observing, off to the side. Transfixed, as she witnessed the exchange between the couple. It was rude to eavesdrop. She should turn away. Avert her gaze a little. Unfortunately, she just couldn’t. Not even if she tried. An inexplicable force kept her rooted to the spot. The taste buds in the back of her mouth twitched, as the bitter taste of bile rose in her throat. Unwelcome, and repulsive. Very much like the experience she was having. She swallowed. And felt sick. Nauseated and trembling internally, she took a deep breath, hoping to trick her mind into blocking out the words, which continued to ring mercilessly in her ears. A battle of wills began raging within her. She knew she was fighting forces much bigger than she was. Forces which only began to reveal themselves a year or two ago. The things she had lived through, turned her into a woman, she no longer recognized. The wheels had come off the bus, and in the process, she was destroying herself. It was like a train wreck you saw coming, but couldn’t stop. Be patient. Keep calm. I am writing my second and third book at the same time! I hope you enjoyed this taster. ← This Hope I Have.